The man who masterminded one of the most heinous murder sprees in American history — is dead … this according to the sister of his famous victim. It says much for just how bizarre the late sixties were in the 1960s, and how many lost souls were running around, especially in California, that Manson had no problem, although clearly crazy and dangerous, in assembling a following eager to do his bidding. As a result of this lunacy a total of seven people would be murdered in the Tate-LaBianca murders, on August 9 and August 10, 1969, with Manson and his followers attempting to leave clues that would convince the police that Black militants had performed the slayings. Being a bunch of drug-besotten losers, the plan quickly backfired with Manson and his loons being arrested and placed on trial. Manson was sentenced to death with his death sentence being commuted to life imprisonment, following the California Supreme Court ruling that the death penalty was unconstitutional in 1972. As a result of this, the relatives of the victims had to relive the crimes each time that Manson came up for parole, he would appeal before the parole board twelve times, and they testified that he should never breathe free air again. The board on his last appearance noted that Manson had never given any sign of remorse for his crimes. His next parole hearing would have been when he had attained the age of 92. He was 83 at the time of his death. Like Dohrn, Rolling Stone later went on to enjoy mainstream respectability despite publishing bizarre views on one of the twentieth century’s most notorious serial killers. Whereas Manson looked every bit the madman on the cover of Life, he appeared as a visionary on the front page of Rolling Stone. Therein, the magazine depicted Manson’s refusal to offer an insanity plea as a principled stand and characterized his criticism of the legal system as “obviously accurate in many ways.” In calling him Charlie, a first-name-basis intimacy later reserved for Madonna, Prince, Bruce, and other singing celebrities, the magazine actively sought to humanize the man who dehumanized so many. Other underground newspapers went further. The Los Angeles-based Tuesday’s Child proclaimed, “Manson: Man of the Year” on one cover and depicted Manson as Jesus Christ dying on the cross under the tag “Hippie” on another. The Los Angeles Free Press ran a weekly column penned by Manson. The Other, playing off controversial remarks made by the president, headlined an issue “Manson Declares Nixon Guilty.” Upon the release of an album of Manson’s music, several underground newspapers provided advertising for it gratis. One of his followers, Lynette Alice, “Squeaky”, Fromme attempted to assassinate President Ford on September 5, 1975. Sentenced to life imprisonment, she was paroled in 2009. Looking back on the evil, wasted life of Charles Manson we see the end to which the misuse of free will can drive a person, and the mystery of why Christ died for even such as Charles Manson, but God can love even when Man can’t. In the summer of 1864 Governor Evans, of Colorado Territory, as acting superintendent of Indian affairs, sent notice to the various bands and tribes of Indians within his jurisdiction that such as desired to be considered friendly to the whites should at once repair to the nearest military post in order to be protected from the soldiers who were to take the field against the hostile Indians. About the close of the summer, some Cheyenne Indians, in the neighborhood of the Smoke Hills, sent word to Major Wynkoop, the commandant of the post of Fort Lyon, that they had in their possession, and were willing to deliver up, some white captives they had purchased of other Indians. 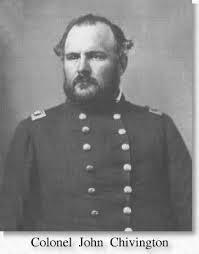 Major Wynkoop, with a force of over 100 men, visited those Indians and received the white captives. On his return he was accompanied by a number of the chiefs and leading men of the Indians, whom he had invited to visit Denver for the purpose of conferring with the authorities there in regard to keeping peace. Among them were Black Kettle and White Antelope of the Cheyennes, and some chiefs of the Arapahoes. The council was held, and these chiefs stated that they were friendly to the whites, and always had been, and that they desired peace. Governor Evans and Colonel Chivington, the commander of that military district, advised them to repair to Fort Lyon and submit to whatever terms the military commander there should impose. This was done by the Indians, who were treated somewhat as prisoners of war, receiving rations, and being obliged to remain within certain bounds. Obscured in our view by the greater conflict of World War II, it is hard for us to realize what an apocalypse World War I appeared to those who had the experience of living through it. One sign of what an immense cataclysm it was, is demonstrated by the fact that the New York Stock Exchange closed for trading on July 31, 1914. This was caused by the closure of all European stock exchanges with the advent of the War. Stocks continued to be traded off the Exchange, and the Exchange was reopened on November 28, 1914 to allow for the trading of bonds. Regular trading resumed on December 12, and a bull market ensued, proof positive of how durable financial markets tend to be and how quickly they adapt to most changing circumstances. Today is the feast day of Christ the King in the Catholic Liturgical Calendar, signaling the ending of the Church year. On this date my thoughts turn to April 30, 1789 when President George Washington commenced the government of the United States under its new Constitution with the first inaugural address. Below is the address. Pay special attention to the second paragraph where Washington acknowledges the role of God in bringing about the American Republic and his final paragraph where he states that America depends upon God’s continued blessing: so His divine blessing may be equally conspicuous in the enlarged views, the temperate consultations, and the wise measures on which the success of this Government must depend. Something for the weekend. I Vow to Thee My Country. This seems to be appropriate for a weekend after Thanksgiving. A pity it is a British Hymn as it sums up perfectly how I view my patriotism and my religious faith. The song is a poem written Sir Cecil Spring Rice, a friend of Theodore Roosevelt, and British ambassador to the US during World War I. The poem started life in 1912 under the title City of God and was rewritten in 1918 shortly before Rice returned to Great Britain. The Great Composer Gustav Holst supplied the music and the song was published in 1925 as a hymn. Abraham Lincoln frequently throughout the Civil War called for Thanksgiving for Union victories and for prayers and repentance for national sins. The idea however of an annual Thanksgiving did not spring from him but from Sarah Josepha Hale, a noted literary figure who, among other accomplishments wrote the child’s poem Mary Had a Little Lamb. Born in 1788, for years she had led a movement for a national day of Thanksgiving to be observed annually. Red Skelton rose from poverty to become one of the most popular comedians of his day. A comedic genius, he created a gallery of comedic personas: Clem Kaddidlehopper, the Mean Little Kid, San Fernando Red, Freddie the Freeloader and others, which allowed him not only to amuse but also to engage in wry commentary about some of the foibles of his time. Skelton the man was fairly simple: he liked to make people laugh, and he loved God, Country and Kids. The love of God and his dying son I have written about in the post The Pope, the Clown and the Cross. Skelton’s love of God and Country shines through in his rendition of the Pledge of Allegiance which I have written about here. Decades ago, a young American was flying across the mountain ranges of Europe on his way to London. Accompanying his friend, a Catholic priest, the two were scheduled to have a meeting with the Pope in England. As the priest talked, the plane suddenly rocked. Then rocked again. Something told the priest the plane was not destined to ever touch land again. The passengers, busy in their individual conversations, failed to notice, the priest observed, until a flight attendant made an announcement of impending doom. The plane was over a mountain range and losing altitude. U.S.S. Arizona Thanksgiving Dinner, November 29, 1917. A ProclamationIt has long been the honored custom of our people to turn in the fruitful autumn of the year in praise and thanksgiving to Almighty God for His many blessings and mercies to us as a nation. That custom we can follow now even in the midst of the tragedy of a world shaken by war and immeasurable disaster, in the midst of sorrow and great peril, because even amidst the darkness that has gathered about us we can see the great blessings God has bestowed upon us, blessings that are better than mere peace of mind and prosperity of enterprise. We have been given the opportunity to serve mankind as we once served ourselves in the great day of our Declaration of Independence, by taking up arms against a tyranny that threatened to master and debase men everywhere and joining with other free peoples in demanding for all the nations of the world what we then demanded and obtained for ourselves. In this day of the revelation of our duty not only to defend our own rights as nation but to defend also the rights of free men throughout the world, there has been vouchsafed us in full and inspiring measure the resolution and spirit of united action. We have been brought to one mind and purpose. A new vigor of common counsel and common action has been revealed in us. We should especially thank God that in such circumstances, in the midst of the greatest enterprise the spirits of men have ever entered upon, we have, if we but observe a reasonable and practicable economy, abundance with which to supply the needs of those associated with us as well as our own. A new light shines about us. The great duties of a new day awaken a new and greater national spirit in us. We shall never again be divided or wonder what stuff we are made of. And while we render thanks for these things let us pray Almighty God that in all humbleness of spirit we may look always to Him for guidance; that we may be kept constant in the spirit and purpose of service; that by His grace our minds may be directed and our hands strengthened; and that in His good time liberty and security and peace and the comradeship of a common justice may be vouchsafed all the nations of the earth. Wherefore, I, Woodrow Wilson, President of the United States of America, do hereby designate Thursday, the twenty-ninth day of November next as a day of thanksgiving and prayer, and invite the people throughout the land to cease upon that day from their ordinary occupations and in their several homes and places of worship to render thanks to God, the great ruler of nations. Done in the District of Columbia this 7th day of November in the year of our Lord one thousand nine hundred and seventeen and of the independence of the United States of America the one hundred and forty-second.